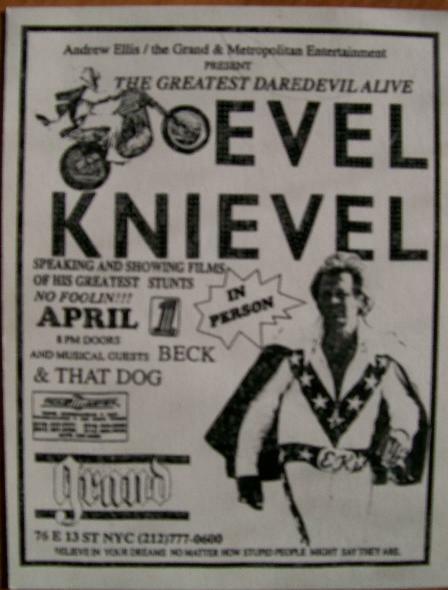 Beck was a musical guest at this event where Evel Knievel spoke and showed films. The event was covered by MTV News! "The author went to see Beck perform at the Grand on East Thirteenth Street. He did play "Loser," but gave the audience the finger with both hands as he started to sing. He used his whole body--he's a small guy--to smash an old acoustic guitar before singing a song called "Pay No Mind (Snoozer)." While playing another song, "Soul Suckin Jerk," he squirted the crowd with water from a toy gun. Several times during the set he poured water over his head, then shook himself off like a dog."